What major heretical doctrines are we seeing today? August Rosado: What major heretical doctrines are we seeing today? Name a few. Nathan Jones: There are three of them particularly I want to address. Certainly, there are many more, but I'll cover just three. The biggest heretical doctrine is Universalism. This false idea teaches that all roads lead to God. We can believe in anything we want to, for God is so loving and He is so gracious the He's going to let everybody into Heaven. August, I have lost some really good, life-long friends to that false doctrine. Guys who grew up Christian, who either because they were in the military and saw horrible things or because they spent a lot of time stationed among other religious majorities and then came back doubting their own faith, they turned into Universalists. They now believe that all roads lead to God. You don't have to worry about sin, as there's no inherent evil. God is so good He's simply going to ignore everyone's sin and just let everybody into Heaven, whether they hate God or not. That's such a lie from Satan. The second heretical doctrine, and it's especially seen in third world countries like when I went down to Nicaragua and other places where people are living in financial poverty, is the Prosperity Gospel. This false idea teaches that God is a big Santa Claus who exists to give us lots of money and food and whatever else we want. We just have to "name it and claim it." But, that isn't what the Bible teaches at all. The Bible is not about us getting rich, certainly spiritually rich by knowing Christ, but not the Bible teaches does God exist solely for our material benefit. The third heretical doctrine, and it's a sad one that is growing within the Church today, is Dual Covenant Theology. This false idea teaches that Christians can believe in Christ and be saved, and Jews as long as they follow the Mosaic Law they too can be saved. It's as if the Jewish people live under a special dispensation continuing to be under the requirements of the Old Testament and that it continues to save them today. But, that's not the truth at all. The name of Jesus is the only name by which we must be saved (Acts 4:12). Those are the three main heretical doctrines that have really infiltrated the Church and society today. Of course, there are so many others. Like I said earlier in this interview, the number one prophecy that Jesus gave in the New Testament is that in the end times there would be a proliferation of false prophets, false messiahs, and false teachers. We live in an age where there are so many false teachers, and it's so easy with communications today for them to get their views across and confuse a lot of people. August Rosado: I can add a fourth one in there. It's a major problem in the Church today that pretty much defeats the purpose of global evangelism. It defeats the purpose of witnessing to people and sharing the Gospel. I would say another serious, serious doctrinal issue in the Church today that is heretical to the core is Calvinism. There are many out there today who unknowingly follow Calvinistic teachings. The cults are not teaching this, no, this is coming from people who say that they are Christians. They are teaching that God has predestined some to Heaven and predestined the rest to Hell. They teach in limited atonement, that Jesus only died for the elect, and that He didn't die for everybody. Therefore, there is no reason for you and I to support missions and world evangelism. We shouldn't then pass on a Gospel tract or witness to someone, because God has already predestined who are going to Heaven and Hell. There's no reason according to them for you and I to be evangelizing the world. Don't you find that to be absolute heresy? Nathan Jones: Actually, I grew up a Calvinist. I'm not a five pointer, if you follow the whole TULIP thing, which is the five points of Calvinism. I didn't even really study Calvinism's opposite — Arminianism — until I went to Bible school and then worked with Dr. David Reagan, who tends to be somewhere between Calvinism and Arminianism. Both Calvin and Arminius were looking for ways to understand God, but they each only got a partial view. August, I think what you're saying when referring to people who do not believe missions are relevant for today, that they are in truth Hyper-Calvinists. I do know Hyper-Calvinists who believe, "What's the point of ministry? What's the point of missions? God saved who He did, and the rest are made for Hell." Clearly that's a confused teaching of what the Bible means concerning election. Then there are Hyper-Arminianists who believe in free-will only and that God has no say in anything related to salvation. What then of the Holy Spirit's work in salvation? August, there has to be a balance in our understanding of election and predestination. As men, we do not have the capability of fully understanding God's Word in this area, because God is so much bigger and He has so many plans that we're not fully privy to. Both Calvin and Arminius were genuinely and sincerely trying to understand how election and predestination works, and still they both ended up with different views. Are we any smarter or given more insight than they? Not to speak for Dr. Reagan, but from his writings and what I've read and listening to him preach, I agree with him that we have to strike a balance in there somewhere concerning election. Yes, the Church needs to be out there witnessing. The Great Commission in Acts 1:8 clearly tells us to bear Christ's witness. That is the Christian's marching orders. If there were people out there who can't be saved, then what's the point of us going, because God has already saved or not saved them. So, yes, Hyper-Calvinism definitely is a false teaching and a problem. I think we have seen in the past the Church kind of atrophy based on that misunderstanding of the doctrine of soteriology (salvation), as so many adherents don't want to get out and witness anymore. 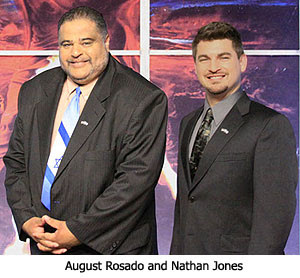 August Rosado: Right. One Hyper-Calvinist guy told me one time in Arizona at a Mexican restaurant we went to, "Hey, Brother Rosado, do you believe in all five points?" I answered, "I most certainly do." Then this big smile came over his face and he said, "You believe in all five points?" I said, "Yes, Sir — B-I-B-L-E." Man, you should have seen the demeanor on his face! It turned from a smile to looking like he wanted to put his hands around my throat. He was just unbelievable! So, I would definitely add that one into the three that you covered. Calvinism I believe is a major problem in the Church. It splits churches and families. I've seen it up close and personal. Yes, it defeats the purpose of world evangelism and so therefore is indeed a false doctrine. In the tenth and last segment of August Rosado's and my discussion of current prophetic trends and events, we will lament the ongoing persecution of Christians today and see if greater persecution lies ahead and if it's been prophesied about in the Bible. There is one more that is prevalent in about every Church in America, it is called the doctrine of Nicolaism. I believe in neither Arminianism Nor Calvinism. Both Calvinism and Arminianism are false.